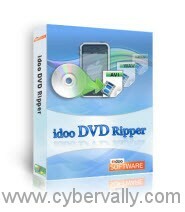 idoo DVD Ripper is a powerful and easy-to-use DVD Converter software for Windows users to rip encrypted and homemade DVDs with fast speed. You can extract audio formats like MP3, WMA, AAC, W4A from DVD of your favorite music. And you can also capture picture in the DVD movie you likein BMP, JPG formats. This powerful DVD ripping software supports iPhone, iPhone 4G, iPad, iPod Touch, iPod, PSP, Zune, Zune HD, Creative Zen, Sandisk, Sony, Motorola Droid, Google nexus one, Archos, iRiver, Cell Phone, PDA, Blackberry, Pocket PC, PS3, Nokia, etc. Merge or split DVD titles and chapters. Merge several DVD titles or chapters into one without interruption. You can also split a title or a chapter into several segement. Crop black bar of DVD – Crop your DVD movie to fit the screen size of your player such as 16:9, 4:3. Easy to use DVD Ripper –Only a few clicks you can finish the ripping with straightforward interface, even if you are a novice. Rip DVD with high speed –This DVD ripper supports multithreading and Multi-Core Processing so that it will rip DVD with high speed. 3. If you do not use Twitter or Facebook, you can still win the license by commenting on how useful this ripper is for you. #Last date is 29th Jan 2011. Great software. Best for ripping DVDs.